This is the area to turn to for interesting tidbits bits of Mark Twain history. 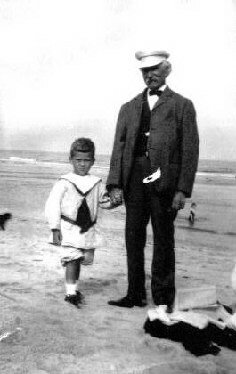 Mark Twain was born in Florida! 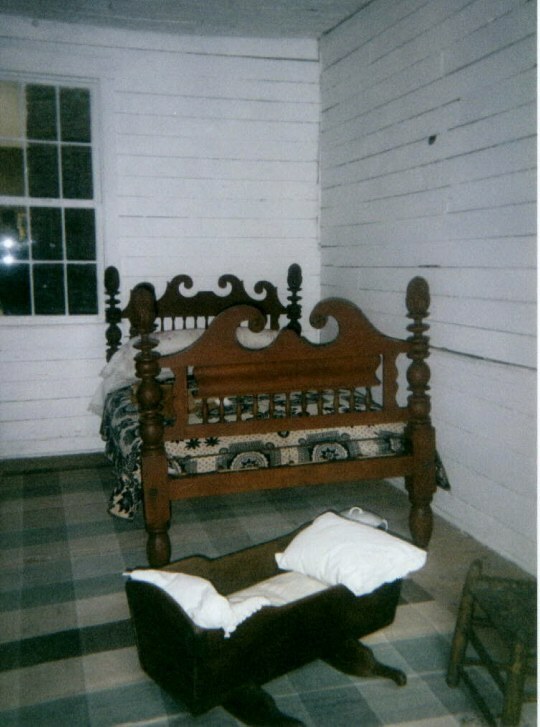 The bed upon which Mark Twain was born, now inside the birthplace home, at the Mark Twain Birthplace Shrine in Florida, Missouri. Anyone who ventures out to Hannibal to soak in the Mark Twain atmosphere would be well advised to go off the beaten path by about 40 miles and be sure to make it to the Mark Twain Birthplace Shrine in Florida, Missouri. There you can actually see furniture the Clemens family owned & used, original artwork, first editions including a rare proof with corrections of Tom Sawyer, and even the house Twain was born in. A shrine was built to shelter the house and it is now an outstanding museum. Together with the Mark Twain Research Foundation, a quarterly newsletter is published titled "The Twainian". Subscription requests for The Twainian should be sent via "snail mail" to The Twainian, Mark Twain Birthplace SHS, 37352 Shrine Road, Florida, MO 65283. 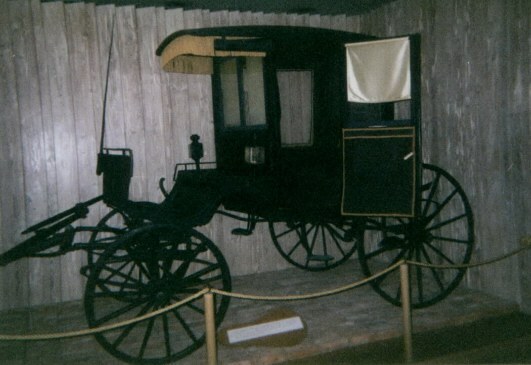 Interior view of the Clemens family carriage. 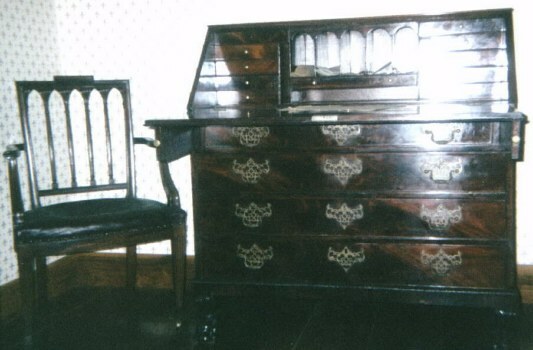 A Clemens family desk & chair. Well, there is more to see than just these few tantalizing gems, so hitch a ride to the "other" Florida on your next vacation! of Mark Twain's alleged Death. 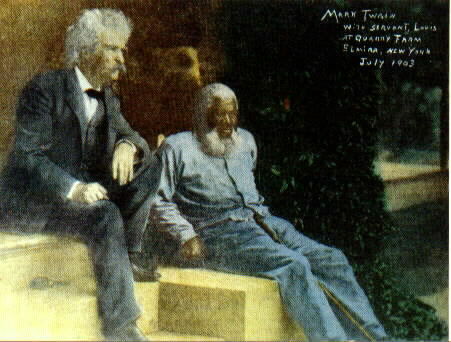 John T. Lewis and Mark Twain in July, 1903, 27 years after Lewis risked his own life to save the lives of those aboard a run away carriage. 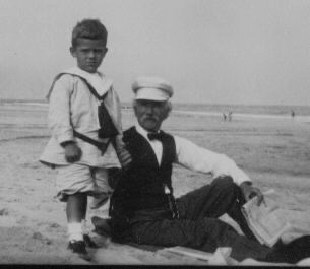 According to Mark Twain, Lewis reflected, "I beg to say, humbly, that in as much as divine providence saw fit to use me as a instrument for the saving of those presshious lives, the honnor conferd upon me was greater than the act performed." "Lewis...is of mighty frame & muscle, stocky, stooping, ungainly, has a good manly face & clear eye. Aged about 45, & the most picturesque of men, when he sits in his fluttering work-day rags, humped forward into a bunch , with his slouched hat mashed over his ears & neck. It is a spectacle to make the broken hearted smile. 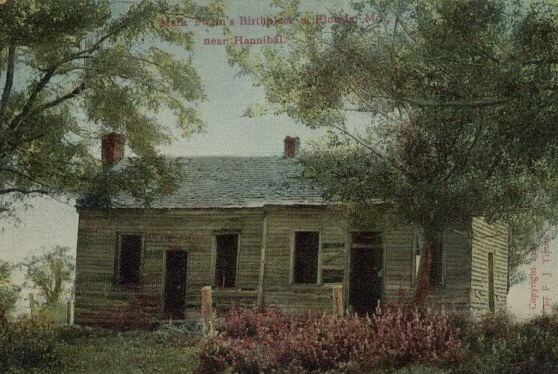 Well, sunset came and Ida the young and comely (the wife of Twain's brother -in-law Charley Langdon) , her little Julia & the nurse Nora drove out at the gate behind the new gray horse & started down the long hill ---- the high carriage receiving its load under the porte-cochere. Ida was seen to turn her face toward us across the fence & intervening lawn. Theodore waved good-by to her, for he did not know that her sign was a speechless appeal for help. 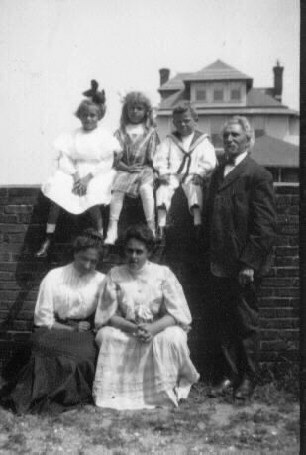 The next moment Livy [Twain's wife] said "Ida's driving too fast down hill!" She followed it with a sort of scream "Her horse is running away!" We could see two hundred yards down the descent. The buggy seemed to fly. It would strike obstructions & apparently spring the height of a man from the ground. Theodore & I left the shrieking crowd behind & ran down the hill bareheaded and shouting. A neighbor appeared at his gate -- a tenth of a second too late! The buggy vanished past him like a thought. My last glimpse showed it for one instant, far down the descent, springing high in the air, out of a cloud of dust, & then it disappeared. As I flew down the road, my impulse was to shut my eyes & so delay for a moment the ghastly spectacle of mutilation & death I was expecting. I ran on & on , still spared this spectacle, but saying to myself "I shall see it at the turn of the road; they can never turn that pass alive." When I came in sight of that turn, I saw two wagons there bunched together --- one of them full of people. I said "Just so --- they are petrified at the remains." But when I got amongst that bunch --- there sat Ida in her buggy and nobody hurt, not even the horse or the vehicle. Ida was pale but serene. As I came tearing down she smiled back over her shoulder at me & said, "Well, we're ALIVE yet, AREN'T we?" A miracle had been performed -- nothing less. You see, Lewis, the prodigious, humped on his front seat, had been toiling up ... saw the frantic horse plunging down the hill toward him, on a full gallop, throwing his heels as high as a man's head at every jump. So Lewis sprang to the ground and...gathered his vast strength & seized the gray horse's bit as he plunged by, & fetched him up standing. It was down hill, mind you, ten feet further down hill neither Lewis nor any other man could have saved them, for they would have been on the abrupt "turn" then. But how this miracle was ever accomplished at all, by human strength, generalship, & accuracy, is clear beyond my comprehension, & grows more so the more I go & examine the ground & try to believe it was actually done. I know one thing, well; if Lewis had missed his aim he would have been killed on the spot he had made for himself, and we should have found the rest of the remains away down at the bottom of the steep ravine." Did you know that Mark Twain was impersonated at a very early date in his career? Since at least the early 1870's Mark Twain was impersonated in lectures, and the impersonations blossomed into the unscrupulous, eventually taking advantage criminally by stealing Mark Twain's identity! Sometimes it would be as harmless as getting in to see a genuine Mark Twain lecture by posing as him. At one genuine Mark Twain lecture he was confronted upon entering because, as the ticket-taker told him, shaking his head, "No you don't, three of you have got in so far, but the next lecturer that goes in tonight pays." Mark Twain actually paid! Of course, this was easily remedied afterwards. However seemingly harmless the first impostors were, they evolved into criminals. Bogus lectures were conducted by frauds, and they not only collected fees, but also skipped out on various bills made on credit from bar tabs to hotel bills. A few years ago we handled a letter by Twain written to a man who informed him that a bogus Mark Twain lecture just transpired in the Niagara Falls area, "Dear Sir: I always hear of these frauds a day or so too late. What I am longing for is a chance to know about one of these bogus lectures 24 hours ahead of time----just once! Truly Yours, S.L. Clemens." 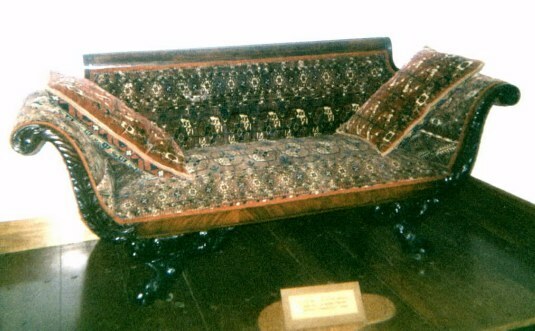 We have discovered genuine antique material which stemmed from such fraud, which was perpetrated during Twain's lifetime. 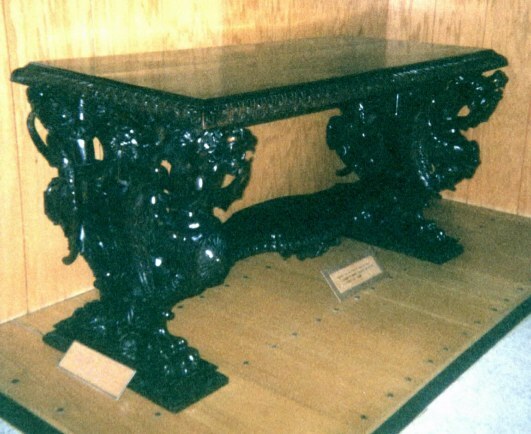 In fact, there are various Mark Twain relics that were created from contemporary impostors ranging from images in books to silk handkerchiefs. 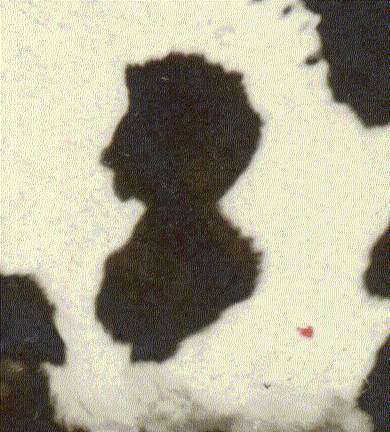 Perhaps the above man was actually the person Mark Twain dubbed as his "Double." 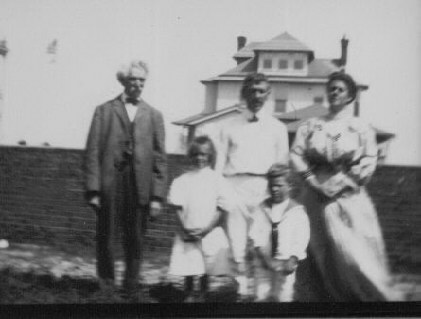 Twain's "double" lectured in various places and never paid his bills because he forwarded them to the true Mark Twain. Twain later remarked about his double, "It delivered a lecture in Satan's Delight, Idaho, on 'The Moral Impossibility of Doughnuts,' a subject I NEVER took the slightest interest in my life...It advertised itself to lecture and didn't ; It got supernaturally drunk at other people's expense... 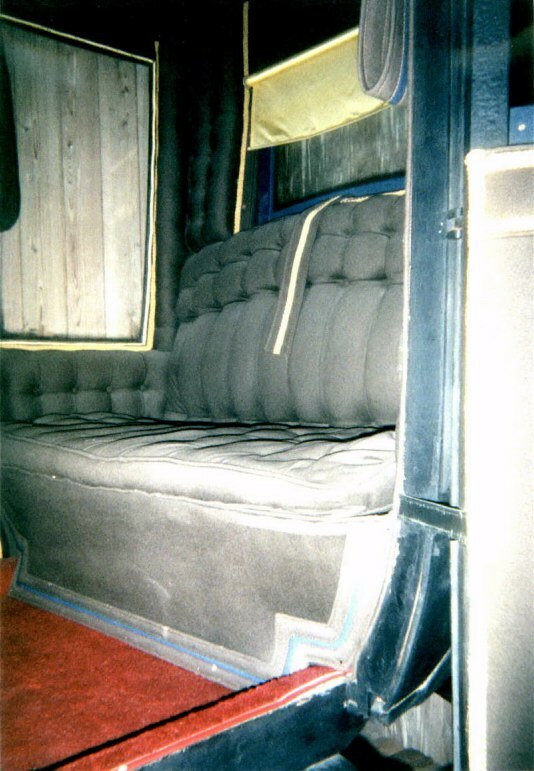 It continued its relentless war upon helpless and unoffending boarding-houses." 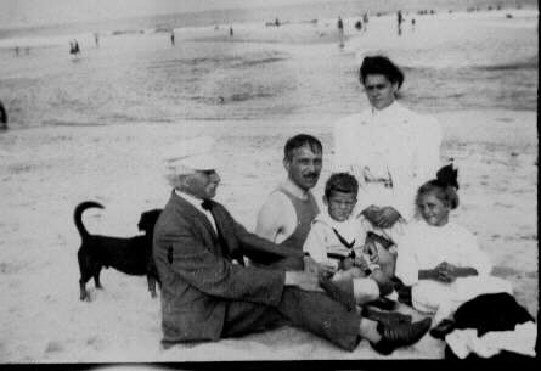 Did you know that Mark Twain gave freely of his time for charitable causes? Did you also know Mark Twain was not simply a typesetter, printer, river boat pilot, gold miner, humorist, author, etc., but was also a talented actor? He was. He also wanted to assist the less fortunate actors. There are so many examples of his generosity that to find all ascertainable instances would nearly drive one insane, but it may be worth the task, because the result would easily fill a book. Just keeping track of his activities to benefit actors is a busy enough task. 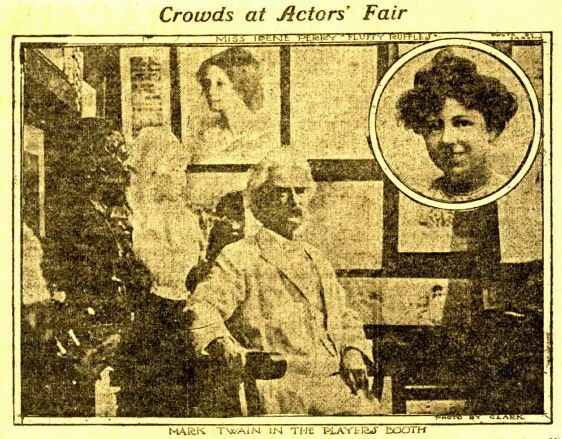 We found a newspaper article complete with a photograph of the man himself during an actor's fund benefit function in 1907. 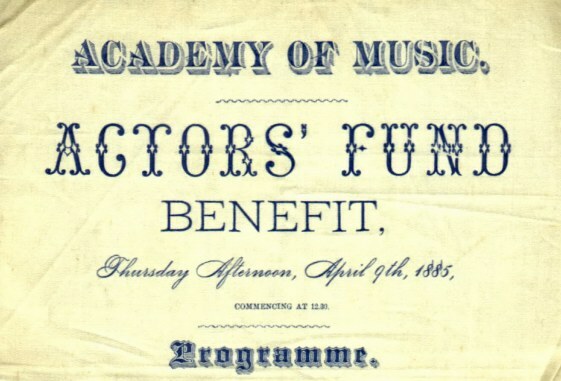 In 1885 one would have been especially rewarded for donating to the Actor's Fund, being able to attend a public performance by Mark Twain reading a portion of his masterpiece Adventures of Huckleberry Finn, followed 35 minutes later by the world famous Kellar the magician! Below are excerpts from a very rare large silk broadside displayed at the actual event. "Never refuse to do a kindness unless the act would work great injury to yourself, and never refuse to take a drink-- under any circumstances." NOTE: The above may have been very wise advice when it was first discovered before the automobile was invented, but Twain would absolutely footnote it with "Please don't drink and drive" concerning the modern automobile today!